One of the flatly most successful systems we went with aboard "Floating Empire" (and one of the ones about which we are most questioned) has been the system we use for dealing with waste. Seriously. I've dealt in my time with portapotti's with removable tanks, with bluewater buckets, and with blackwater systems. Having now dealt for most of the year with a very simple bucket composter, I can honestly say I'll never have any other system in a vessel, and maybe not even in a house. We did a bit of an entry early in the construction of the boat on the system we use, but I thought, at this juncture some 7 months in, it might be useful to revisit. Our system has three very simple elements: We have a lid and seat from "Luggable Loo", intended largely for camping toilets. 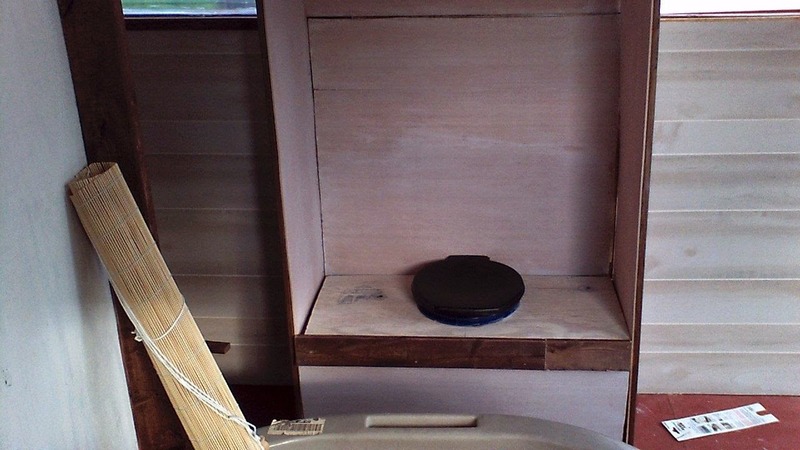 The system, intended for camping, consists of a toilet seat and lid designed to snap onto the top of a 5 gallon bucket. 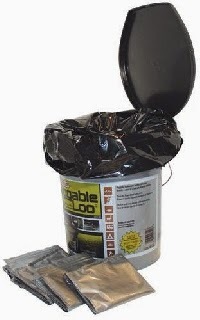 The full Luggable Loo system from Reliance. The full system includes the lid, bucket, liners and stuff to put in the toilet to deoderize, and runs less than $40 US. We used only the lid, which can be purchased for about $15.00 from most sporting goods stores or on the web. We cut the top six inches from a 5 gallon paint bucket and affixed the lid to it. This enabled us to leave the lid and seat assembly attached in place in the head. Since the buckets are tapered, the cut off bucket fits nicely into the top of a full and lined bucket in the box of the toilet. The original version had a urine diverter (the white hex in the front is the outlet), but we finally did away with it as more trouble than it was worth. The head boxed in during the original construction. 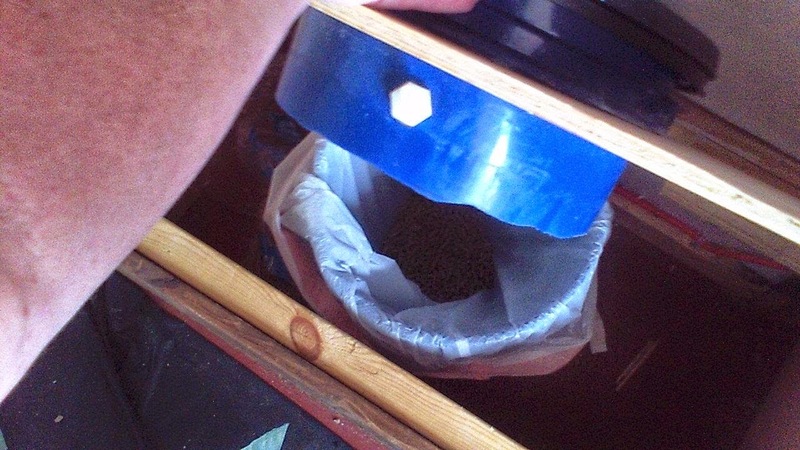 The basic use of a composting toilet system is easy: Line (or don't) the lower bucket with a biodegradable bag (we double it), put a couple of inches of dry composting material in the bottom, then every time you use the head, throw in just enough of the material to cover what you just did. When it gets 3/4 full, dump the bucket into the compost, and repeat the process. When the dump winds up in a dumpster (can we do that? Where do you think all those disposable diapers go? ), we double line the bucket with biodegradable bags. If headed to a compost pile, it's really only necessary to "flour" the interior of the bucket to prevent sticking. At first we used sawdust from our construction, but that soon ran out, so we hit on the happy expedient of using wood stove pellets. 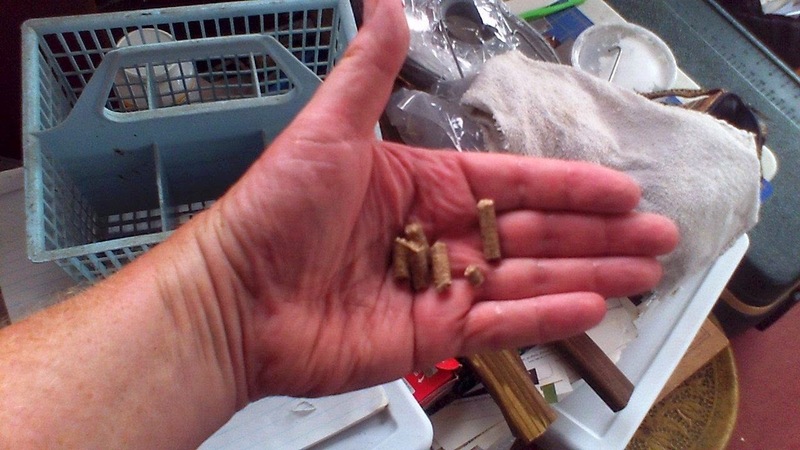 The pellets are compressed sawdust, which expand when they get wet, absorbing the liquid. They're far more compact than sawdust to keep around, and a bag lasts us months. Other things work as well: shredded wood compost, coir (coconut husks), shredded paper insulation; it only matters that the material is dry and can absorb moisture. We get asked all the time how often we empty the toilet. It rather depends. There are two of us living here (the cat having her own arrangements). In winter, or during lousy weather, when we're aboard all the time, we find we empty the bucket about every five days. In summer, when we're ashore adventuring or out on other vessels, it can be far less. We have two buckets and a lid, so we can change out the bucket without absolutely having to truck it up and off the boat if inconvenient. We just switch them out and empty when convenient. In some weather conditions, there can be quite a bit of condensation from the compost, which usually winds up on the inside of the toilet lid. It's just water, but it can be a rather unpleasant shock in the middle of the night. Good ventilation or a moisture absorption material like "DampRid" inside the toilet chamber does a lot toward eliminating this. Don't let dumping the thing wait. It's HEAVY when completely full. Thats why we have two buckets aboard so we can change them out at will and truck them ashore when we feel like it. Separating urine can cut down on the number of times a month you'll have to empty the compost. Many toilet systems use a urine separator, or just a simple urinal for the guys to use so that all the liquid doesn't wind up in the bucket. Use a simple toilet paper that will break down. Don't forget to add the absorption material. Otherwise you get a puddle in there which CAN smell. Keep it locked into the sawdust, and you'll have no problems. It is such a simple thing, rather like emptying the trash. It doesn't smell. There is no pumpout involved, no combustion toilet, no water is wasted. As water becomes more and more a commodity, I'm frankly thinking the humble composting toilet may be something we see in more and more homes in the future. New stuff in our other blogs Life, Art, Water and Onboard Cooking. Check em out. I've tried to sell my wife on this idea for a shanty boat I'm planning to build but she is really against the idea. I wish that there was someone in Oregon who effectively uses this system so I can show her how effective it is. By the way, what bags do you use? All of the reviews I read online of various biodegradable bags said that they break down really fast with wet or liquidy items. Convincing folks that have never seen this done. Really, Mrs. Jarm, the system is incredibly easy to deal with, does not smell, doesn't require you to handle nasty stuff, and is, in general, a whole lot simpler, more sanitary, and less smelly than any of the alternatives we've experienced (not to mention, it's an environmentally friendly choice, doesn't contaminate water, and is LOTS less expensive). My wife feels the same way. As for bags, we've used a number of different 30 quart garbage bags (the size used for tall kitchen garbage cans) that are designed to break down in landfills. We only use the bags if the stuff is destined for the dumpster, in which case, we double bag them. (Otherwise we just "flour" the bucket with sawdust and dump it into the compost.) Yes, they break down, but not fast enough to die before you have to dump them. We will often switch out the buckets, snap a lid on the filled one, and leave it on the foredeck or dock until dumping is convenient. Again, no odor, even in summer. By contrast, your typical boat blackwater system reeks, they tend to clog (and THAT is fun repair, believe me), and must be pumped out at a marina pumping station in order to avoid contaminating the water. I have never seen one that didn't smell. I'm sure if you check out Cruiser's Forum or some of the other boating sites that you can find someone in your area running a marine or bucket composting system that you can view. How about it, anyone on here in Oregon running one of these Jarm could see? Thanks for the information. I'll do some research on some forums to see if I can find someone in my area.